In a film that could be described with some accuracy as the 'real' story behind The Devil Wears Prada, The September Issue follows Vogue fashion editor through the production of the trend setting, fashion-defining bible that is the publication's September issue. The documentary style is very observatory, avoiding any real criticism or in-depth exposure of the working guts of Vogue (no doubt for reasons related to trade secrets). The film does document Anna Wintour's working style quite extensively, which is exact, decisive, powerful, and everything but warm. This no holds barred portrayal brings out Anna's passion and dedication for the magazine - a craft she loves more than anything you or I will probably love in our lives. This passion is in part what demands respect from her peers - her extensive knowledge and taste is beyond the understanding of even her colleagues at times, which is often the source of her frustration and intolerance. 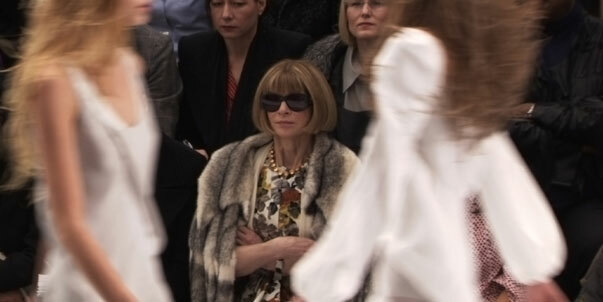 The true gem of the film is the portrayal of Anna Wintour and Grace Coddington (Vogue's Art Director). Friends for over twenty years, these two for all intents and purposes create the ultimate vision and art of Vogue. Between them lies an almost unbearable tension - the two women staring at each other, poker-faced at a stalemate over which dresses to use, which photos belong in the issue, and why there is always too much black. Ultimately, fans of fashion or those interested in the magazine industry will love the film and be able to appreciate the art and passion behind Anna Wintour's cold demeanor. Others may take upon themselves the attitude of Anna's daughter - a prospective law student who doesn't understand the obsession with fashion, and ultimately doesn't consider the pursuit to be the ultimate concern of life.